I used to be someone who never ate breakfast. For years it just didn’t appeal to me. I’d grab a cup of coffee or tea and then be on my way in the morning. If I was actually hungry I’d have a piece of toast. However, in the last 5 years I’ve started eating at school with my students and I eat at home most days too. I’ll start off by saying I’m not one to go out for breakfast because even though I do eat breakfast I don’t eat much of it. 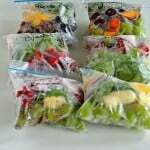 The other problem is that I often eat on the go because I don’t have much time. Sometimes I’ll grab a granola bar and other times I’ll eat an English Muffin on the run. When I do have time to sit I usually have oatmeal or on occasion a piece of coffee cake. In the summer sometimes it’s too hot to eat anything but yogurt. So when I teamed up with Barlean’s for their Popsicle Party I immediately thought that I could make a breakfast popsicle. What could be better on a hot day then an ice cold popsicle that could double as breakfast and can be eaten on the go? 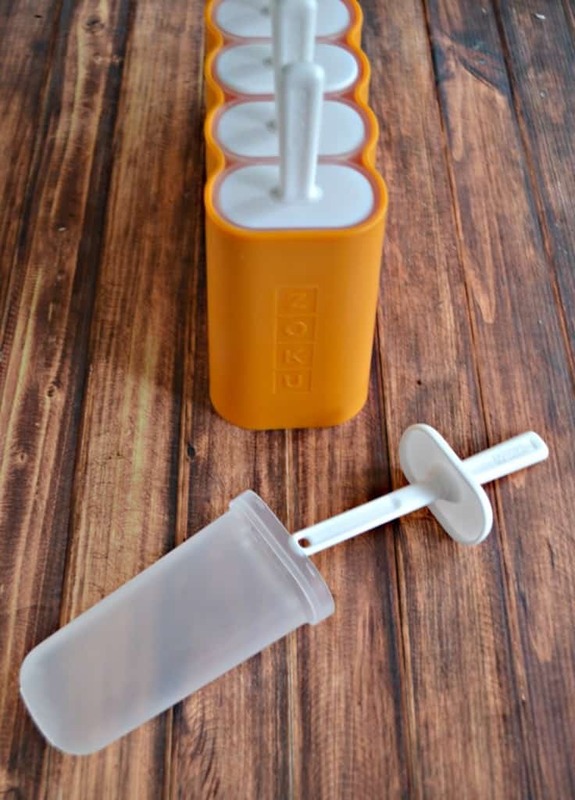 I was also excited to receive a popsicle mold from Zoku. I’ve had cheap popsicle molds before but these ones are really nice. They have a rectangular holder that holds the pop molds and the stick is plastic and goes in the mold easily. The shape makes it perfect to fit in the freezer door so it doesn’t take up a ton of room in the freezer! I started with plain Greek yogurt. Greek yogurt is lower in sugar than regular yogurt and it’s packed with nutrients. It’s also one of my favorite things to eat for breakfast. Then I added in some milk to help thin it out. I figured popsicles need some sweetness so I put in just a bit of honey. I finished the pops off with Barleans Superfruit Strawberry Kiwi Greens Powder. The Superfruit Powder is an awesome way to get the delicious flavor of Strawberry Kiwi with the added benefit of berries, fruits, and vegetables. It’s a power packed powder and the perfect way to start the day. It’s what gives my Strawberry Breakfast Popsicles their delicious flavor and gorgeous pink color. Now that I had milk, yogurt, fruit, and veggies there was one more thing I wanted to add and that was granola! 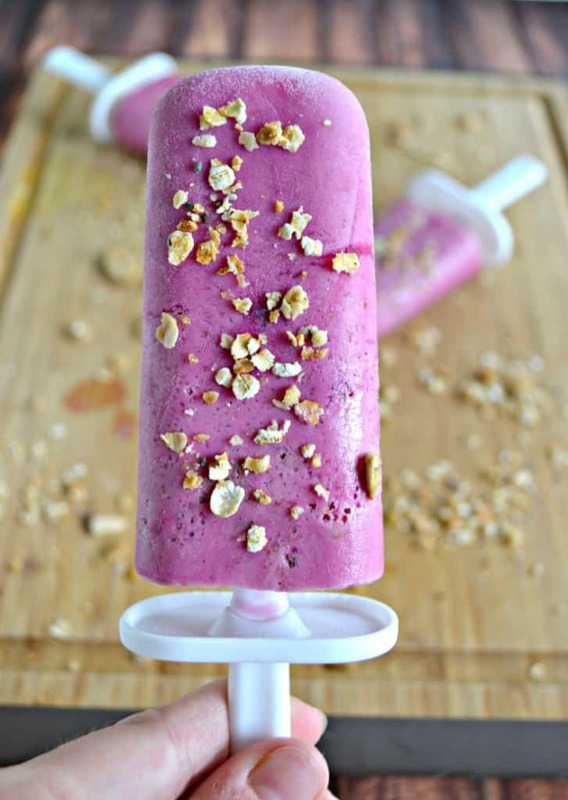 Granola adds crunch and flavor to any breakfast and I love to eat it on top of my yogurt so I thought it would be awesome in these popsicles. While you can use your favorite granola I made my own batch with oats, chia seeds, almonds, and sunflower kernels. I sprinkled the granola in the popsicles at the end and then froze them. When it was time to take them out I ran them under hot water for 10 seconds and they popped right out. The flavor was really good! It tasted like strawberry Greek frozen yogurt with a hint of granola crunch. I actually ended up dipping the top of the popsicle in the leftover granola for even more crunch. This is such an awesome breakfast popsicle to enjoy on the go. It cooled me off and delivered everything I need to get me going in the morning! Give them a try for yourself, kids and adults will both enjoy these! 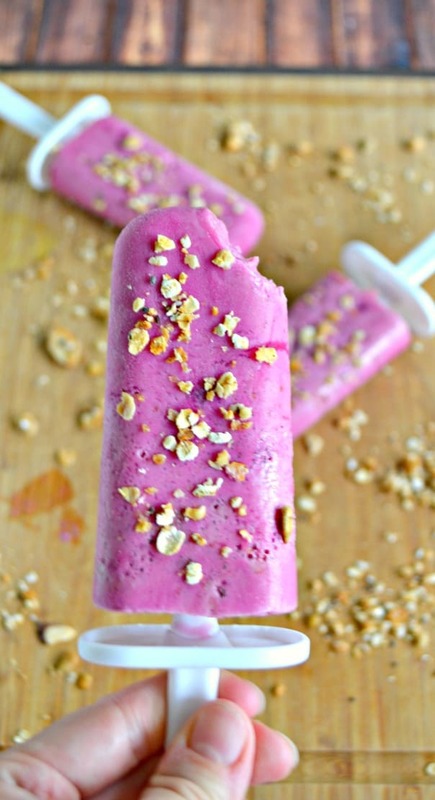 Take your breakfast on the go with these delicious Strawberry Greek Yogurt Breakfast Popsicles with homemade granola. In a bowl combine the oats, chia seeds, almonds, sunflower kernels, cinnamon, sea salt, and coconut oil. Mix well and spread out on the parchment paper. Drizzle with the honey then use your hands to mix the honey into the mixture. Bake for 20-25 minutes, mixing the granola halfway through, until the granola is golden brown. Remove from the oven and cool completely. 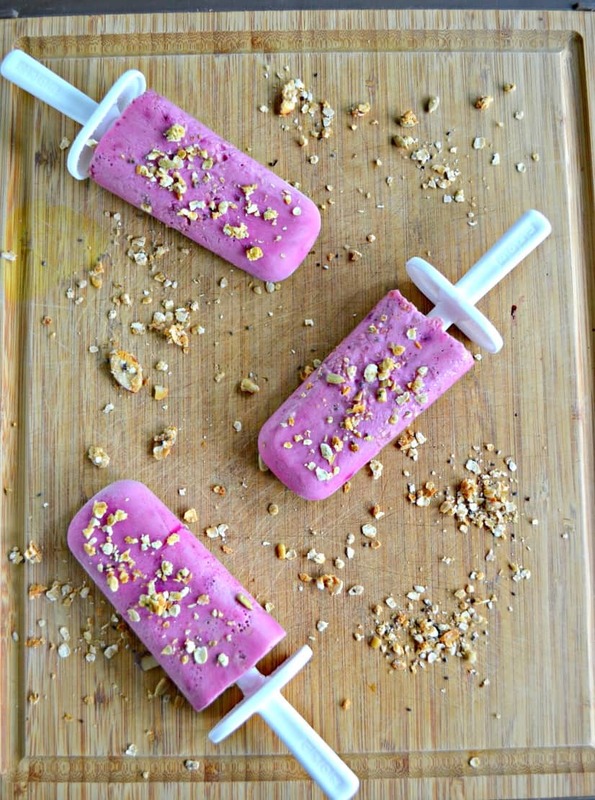 To make the popsicles combine the Greek yogurt and milk in a large bowl. Whisk to combine. Add in the Strawberry Kiwi Greens Powder and honey and whisk until smooth. 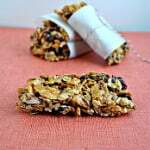 Fill 6 popsicle molds until they are 1 inch below the rim and sprinkle with 1 tablespoon of homemade granola. Placce the stick in the popsicle mold and freeze for at least 6 hours. When ready to enjoy run the popsicle mold under hot water for 10 second and remove the popsicle from the mold. If desired sprinkle with an additional 1 tablespoon of granola. 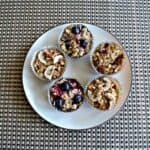 « Baby Food Fridays: Snack Review! Looks great…..you make it look so simple and beautiful..